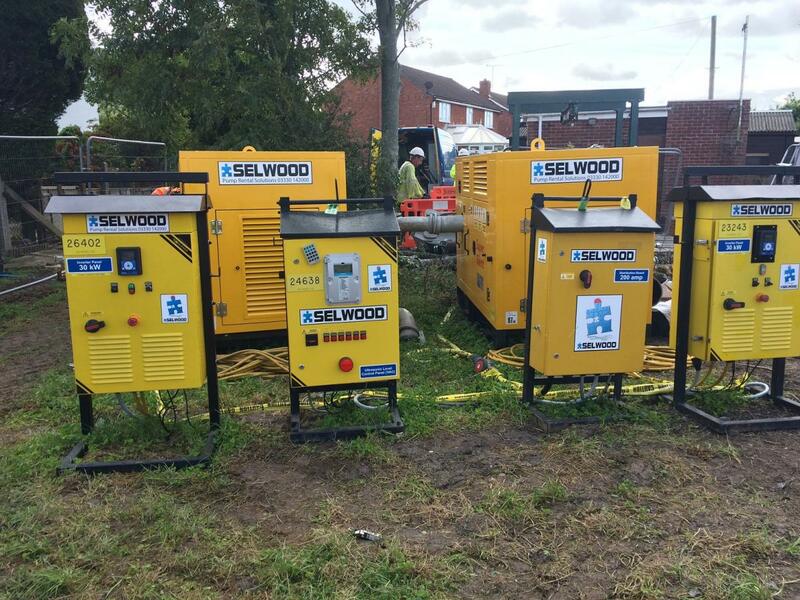 A new environmentally-friendly and highly-efficient pump from Selwood provided the ideal overpumping solution during a major flood infrastructure upgrade in a sensitive location. The S150 Super Silent electric drive, one of a new range of solids handling pumps from Selwood, provided a robust solution for Wessex Water that minimised risk to the environment and prevented disruption to the local community. The application came as Wessex Water’s engineering and construction department was tasked to make improvements to a number of sewage pumping stations as part of the Brent Knoll flood relief scheme. Brent Knoll is situated in Somerset on the edge of Sedgemoor and within three miles of the Bristol Channel. The scheme included construction of a new sewage pumping station (SPS), decommissioning of two existing SPS’s and the refurbishment and modification of another SPS to relieve flooding issues experienced in the village. The refurbishment of Forge House SPS required replacing existing 50-year-old infrastructure in order to provide increased flows and robustness. The wet well had to have benching replaced that required isolating for the anticipated duration of the works. In addition, the motor control centre was also being upgraded at the same time, therefore preventing the use of the existing mains supply. It was agreed that overpumping would be required to keep the SPS operating without causing any impact to the local community. Wessex Water’s site manager James Chinn contacted the Selwood framework manager, Phil Ingleheart, to request a site visit and discuss the site-specific requirements and challenges. Due to the proximity of water courses, traditional diesel driven pumping options were ruled out. Traditional electric submersible pumps were not suitable for the application because of lack of room in the wet well. Furthermore, Wessex Water required an even quieter solution due to the proximity of residents’ houses nearby. In short, the team required a fully automated duty/standby overpumping arrangement backed up with remote telemetry which could match the pumping duty required. • Capable of the same superb performance as Selwood’s 1800rpm diesel-powered model, providing 100mm solids handling. • Variable speed drive to ensure the perfect balance between efficiency and performance depending on the application. • Suitable for multiple uses including water and wastewater, sewage and sewer bypass and overpumping. Phil Ingleheart, Selwood framework manager, said: “By using these end suction pumps which are even quieter than their industry recognised Super Silent diesel units, Wessex Water saved time and money from having to demolish and rebuild a manhole large enough for traditional submersible pumps. “The entire control system was installed and programmed by Selwood’s in-house electricians. This benefitted the client by only using the required amount of power and fuel to run the pumps. “During low flows at night this protocol significantly reduced sound output to the benefit of the local residents, while the client saved money at the same time. James Chinn, the site manager, added: “This was a really good system which was hassle free and backed up by automated telemetry. Selwood is the number one pump rental solutions provider in the UK and its products are available from a comprehensive national network of branches.